Nokia’s press event at Mobile World Congress was all about the budget-friendly crowd which makes the introduction of the Lumia 521 on T-Mobile perfect for the first-time smartphone buyer. Nokia may have referred to the Lumia 520 design as “pillowy,” but with exchangeable cases in yellow, cyan, white and red there’s some opportunity for customization. The Lumia 521 brings a 4” 800 x 480 display to the table, 512RAM, 8GB storage with a microSD slot, 5 megapixel camera with 720p video recording, 9.9mm thick and HSPA+ 21Mbps connectivity. Early hands-on show the Lumia 521 is “solidly” built, if a little cheaper feeling than higher-end Lumia handsets, but comfortable to hold. Nokia seems perfectly content with their new lineup introduced Mobile World Congress hitting the budget friendly crowd as CEO Stephen Elop expressed his desire to hit lower price points to broaden the company’s appeal. According to an early February roadmap, T-Mobile plans on launching the “Nokia Flame (4G)” on April 24th and we’re betting the Lumia 521 is that device. The Nokia Lumia 520 is Nokia’s most affordable Windows Phone 8 smartphone, delivering experiences normally only found in high-end smartphones, such as the same digital camera lenses found on the flagship Nokia Lumia 920, Nokia Music for free music out of the box and even offline, and the HERE location suite. A four-inch super sensitive touchscreen makes for a more responsive and immersive content experience than can usually be found at this price. The Nokia Lumia 520 comes in five colors, with an estimated starting price of EUR 139, before taxes and subsidies. Roll-out is planned to begin in Q1 2013 in Hong Kong and Vietnam, before expanding broadly in Q2 to markets in Europe, Asia – including China and India – Latin America and Africa. 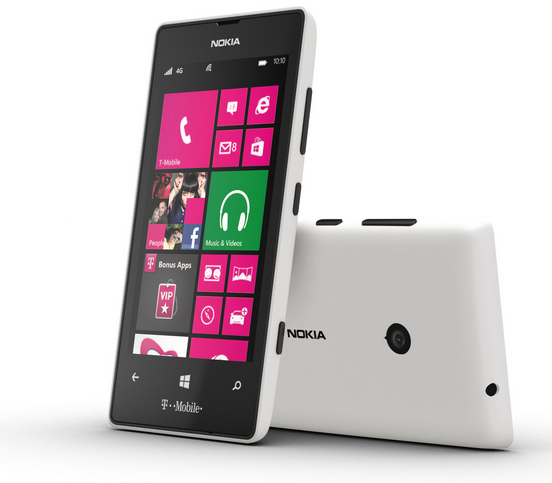 The Nokia Lumia 520 is also planned to roll out in the United States with T-Mobile. I’m confused… Is it the Lumia 520 or 521? The press release says 520, the video says 520, but the article header says 521. That’s Nokia’s generic press release, the 521 is specific to T-Mobile, just as the Lumia 810 was T-Mobile’s version of the Lumia 820. Thanks for the clarification, David. I’m still looking for more LTE info here in Houston. ;) It’s been a no-show ever since I last emailed you. If it’s 200 without a contract it’s a great deal. I need a new phone for my mom this might be it. I’m sure they’ll mark it up to $500, but offer $400 MIR on 2 yr agreement. Haha. Would rather have the 620 then this. Ill stick with my L9 on the monthly plan for now. A flash on the camera for dark shots has a become a must for me. Don’t know why they would leave that off these days. With this phone only costing about $183, this should be an easy off contract purchase foe those looking not to extend their contract. It will definitely be in the prepaid section as well for T-Mobile, good one. I’m a little surprised they’re not calling it the 510 if even just for the sake of consistency. I wasn’t aware. Thanks for your immaturity, troll. I guess it fills a product quadrant but Really I want a high end phone from Nokia! Hey @David do you think the Nokia 920 will ever be sold unlocked in America so it will work on T-Mobile’s Network like the Nokia 900 did? I see the Nokia 900 on Groupon a lot. i like Nokia .. i like Windows Phone but i don’t know .. Nokia just isn’t doing it for me. Yet just a month ago there was an announcement that Nokia was ending their smarphone creation… Windows Phone is just plain horrible, period! Anyone who buys one will quickly find themselves trying to get rid of it. Huh? What? Oh its the internet, nevermind. While I respect your opinion, windows phone is far from horrible lol. I don’t think it’s horrible, I love my 8X. I’ve had zero problems with it. So that’s like, your opinion man. yet another low-end device for Tmobile. When will they learn? There is a smartphone for everyone, and this one is no exception. It’s gonna be a nice phone, and IS high end to the right person. Samsung Galaxy 3/Note 2, HTC’s latest WP8, and HTC One….What exactly are they missing? Go to Verizon/AT&T/Sprint and buy the same phones that T-mobile has with the exclusion of the iphone(even though it too is coming to T-Mobile). You, sir, are a troll. oh really, do they have NL 920?, did they have NL 900, I didn’t think so. Just because a person is entitled to their own opinion doesn’t mean they could be labeled troll. Do you really need a T-Mobile branded Lumia 900 or Lumia 920 when an unlocked model will work fine on T-Mobile’s PCS/AWS HSPA+ network and AWS LTE network? Actually, yes I would. Since, I am tying myself to a contract I should be able to get the device of choice. You are a troll. Move along. Don’t be mad because you’re being called out for what you are. If you would like to switch to a different carrier, please do. Have a great time, but take your trolling self elsewhere, too. Do you think that he is voicing his opinion just to make you guys mad? Getting a 920 operating on 1700 unlocked model is no walk in the park for the avg consumer. Nope, is just a click away on ebay.com! I would like a 900 or 920 coming from Tmobile. Not from At&t or Verizon. To actually have no choice in high end phones is really hurting T-mobile and is why Nokia losing market share in the USA. T-mobile customers who don’t really follow smartphone tech will only see Nokia as being a cheap phone maker and who will see At&t users having the premium handset on any given platform. If Tmobile trying to separate themselves from subsidiaries, why offer the low end when they could offer high end devices with affordable service? That doesn’t make any sense. If it means paying a little more through eip, I would like to pay for a device that is worth paying more for in order for it to be a phone that natively works with T-mobile! Am I really in the minority here? Thats my point! Why do I need to go to another carrier in order to pay for a highend device? T-mobile is pretending to offer cheap lowend devices while charging for more it’s cost. It would make more sense to up charge highend devices while offering cheap service. Well, considering the only one that will work is the developer edition which is around 1k dollars it might be worth it to jump ship, other European unlocked models retail at 800 $ but even then they don’t Show to have AWS1700/2100 band 4 basically so unless he’s in a refarmed area he’s honestly better off going somewhere, but that’s my personal opinion, I don’t see myself paying more than 800 $ for a phone, 750 is my limit. Yes TMO has those phones but people do want something other than HTC or Samsung as a top of the line phone. Yes we could buy the phones unlocked but they are expensive unlocked and full price. Even if you pay full price eventually on a value plan with payments, those payments make it easier to pay for than having to cough up 550-600 bucks upfront. That for me is the issue. Middle of the road phones and entry level they have plenty. I understand what both LinkArt and Even Carter are saying but there are nice Motorola, LG, Sony, and others that are not being offered. I don’t think this comment is about an Iphone. I think the 920 was a deal with the devil that, unfortunately, Nokia had to make. That said, if tmobile can’t up their WP game soon, I’ll be forced to up my bitching and moaning, while taking no action whatsoever. It’s another low end device because around half of TM’s customers are still using feature phones and are not going to go from a $50 flip phone to a $500 smartphone in one step. The clear direction across the industry is to move everyone over onto using data-enabled devices. That isn’t going to happen if the choices don’t include budget devices. Since subsidies are going away, do what others do-buy the unlocked phone you want and enjoy. Simple, really. Yea I don’t really see why you wanna switch just because they are releasing a phone that someone who doesn’t have 200-300 bucks can buy. This could be a great starter device for people who have never used smart phones or for kids. Besides that EVERY OTHER carrier does this. But yes you are most definitely a troll. If it’s less than $200 then this is a pretty good buy. However I’m bummed it’s not the 620 which is a midrange phone that has gotten fantastic reviews (and doesn’t cost that much more) or the 720 which I think we’d be willing to pay a little more for. Yes. Bunch of phones rolling out on T-Mobile before April. This is what I love to see. Moves like Tmobile getting the 521 are just stupid! It doesn’t even have a flash on the camera. Why would they not at least get the 620 or better yet the 720 which looks better then there 810! Who makes these poor descisions. This will be a good budget device to get those consumers who are curious to try Windows Phone but don’t want to spend the money on the 8X or the 810. If it’s priced right w/ a prepaid activation of course. here is the real reason why T-mobile will continue as the county’s #4 national carrier. Continue to treat their customers as third world class citizens since they either too cheap to buy high end devices or too poor to afford the competitors. Dear Tmobile, THANK YOU for being the market leader for bottom of the barrel el-cheapo phones. We consumers appreciate your marketing geniuses who continue to let Nokia exclusively give their (confusing & expensive) high end phones to AT&T. Thank you for saving us from these high end models that cost so much money, and have so many confusing innovative features. Simple and cheap shlock is king!!! Oh look…another watered down phone. 920 or die. They’ve got the right idea with this device but I still wish they would have gotten the 920 instead of that boxy lookiung 810 which was a lot more expensive than AT&T’s 920. This phone and the 920 would be the perfect Nokia Lumia lineup. And I know you can unlock a Lumia 920 and get 4G , but I’ve done that with my One X and my Vivid and I hit Edge quite a bit even though I’m in a refarmed area. But my One S is pretty rock solid on 4G all the time. Just would have loved to have a T-Mobile version of the 920.